In Nature animals eat their prey whole. Dogs are equipped with strong jaws and sharp teeth that are made for ripping and tearing meat. They also have very strong stomach acids, as well as very short digestive tracts that are made to efficiently process raw meat and bone. If you watch your dog gnaw for hours at a bone you've given, you'll understand how perfectly natural it is for these carnivorous animals to eat this way. For dogs, eating the way nature designed them to eat fosters a host of physical, physiological and psychological health benefits that an unnatural diet of processed dog food simply does not. The form of the foods we feed our animals is key. As is true with our own diet, the closer the food we feed is to its whole, unprocessed, natural state, the better it is for ourselves and our pets. Because commercial pet food contains so many starchy, plant based ingredients like corn, soy and rice, that are completely unnatural for carnivores like dogs to eat, it isn’t nearly as digestible for them as raw food. As a result, the consumption of such manufactured products often makes for unnaturally large, extremely smelly stools that take a very long time to decompose. While proper oral care is a factor in bad breath, so is gut health. Because a raw foods diet is better suited for a dog's digestive tract and digestion is improved, that means no putrid waste in the gut. The body uses more and wastes less. Wasted is moved out more quickly. Everything works more efficiently and will reflect in the breath as well. Again, because the foods are more like what your dog was designed to eat, the body is getting more of what it needs and less of what it doesn't. Not only does that mean less waste, and less smell, but it makes better compost. A raw diet makes for greater bioavailability of naturally occurring nutrients and enzymes. Simple as that. Our dog buddy was having a problem with reoccurring ear infections. Smelly, yeasty ear infections. Our vet prescribed ear drops and advised that if they didn't work, we would need to look at diet. The drops worked, but the infection would come back. We switched to better quality, grain free foods. It helped, but didn't cure the problem. I began researching to seek others' experiences. I kept seeing raw diet. There are different levels of raw. The best option for my family is a prepared raw like Stewart Raw Naturals Freeze Dried Dog Food. 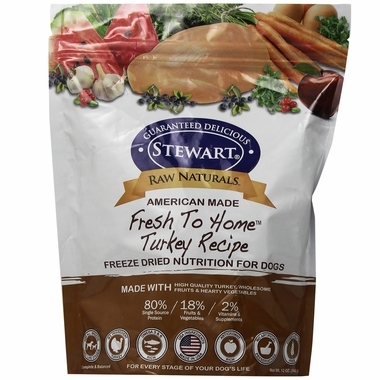 Stewart Raw Naturals are freeze dried raw ingredients that are human grade. Prepared with whole meats, fruits, and vegetables to allow your dog to develop and maintain a healthy digestive system and proper weight management. 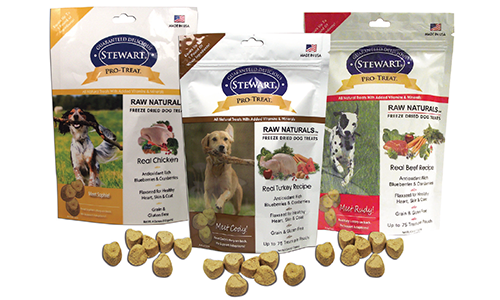 Stewart foods are perfect for all breeds and ages with a taste your dog will love. Even my cats have tried to break into the bag! Just check out some of the ingredients! It comes as freeze dried pellets. We like to take a bit of water from the kettle and pour over his serving and let set until room temperature. Sometimes I add a spoon full of coconut oil. Buddy really loves it. Stewart is sold in your local Petco & Petsmart. Or use this form for a retailer near you.